I'm so excited for my post today! I had wanted Nerd Lacquer polishes for ages and it seemed like forever until the Etsy store re-opened for orders again. I chose four polishes: Resolutionary, Don't Blink, Event Horizon and Pinin' for the Fjords. I actually wanted a few more but I stopped at four, I'll get the others when the store opens again! The polish I've chosen for today is Resolutionary, a bright pink polish with lots of glitter! 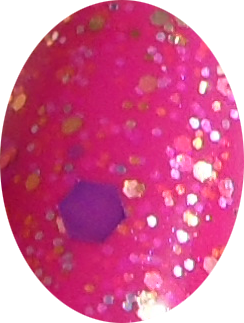 There is gold and pink, small and medium, round and hex glitter and larger pieces of purple hex glitter. The formula on this was amazing, it went on easily and gave me full opacity in two easy coats. My only problem with this nail polish is that my camera wouldn't focus on it properly! These pictures don't show the true beauty of this polish, but here it is! Macro, look at all that glitter! As you can see, this is such a beautiful polish. I can't wait to wear this again! I think it'll look so nice on my toes as well in the summer. Find it here on Etsy for $10 when the store opens again.